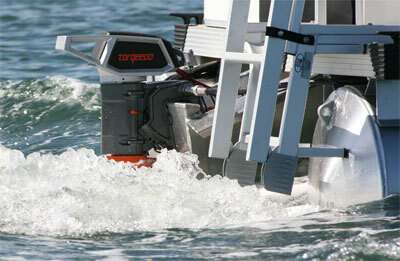 The Torqeedo homepage features details on the Cruise outboard motor. Torqeedo reports the Cruise that offers boaters more power and range from the same battery supply. With thrust equivalent to a 9.9 hp gas outboard, the Cruise 4.0 R achieves an efficiency of more than 50%. According to Torqeedo, the Cruise converts supplied battery power into propulsion, measured as speed times thrust after all losses. This includes propeller loss at a rate comparable to an 8 hp gas outboard in displacement mode. Extremely powerful, the Cruise 4.0 R recently pushed a well-stocked 24′ pontoon boat with 25″ pontoons and seven people aboard at a recorded speed of 6.1 mph. It operates on 48 V lead-gel, AGM battery bank or two high-performance lithium manganese batteries from Torqeedo’s Power series. An integrated board computer combines information from the motor, batteries and the motor’s GPS receiver, so boaters always know how much battery power and range is remaining. This information is easy to view on the remote throttle display, which also provides current speed, speed over ground and current power consumption in watts. >Cool Outboard – I want one ! !